With its new and updated innovative design, the Snap'n Strain will take the strain out of straining. 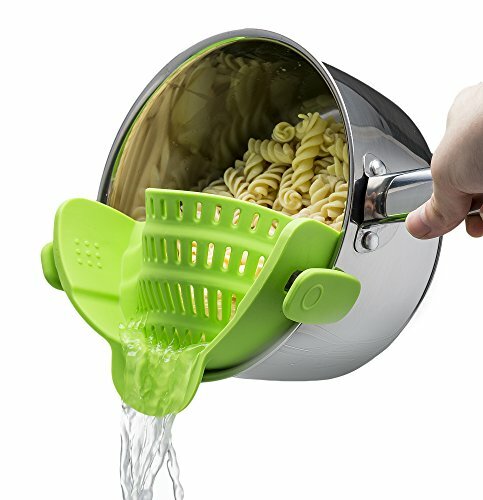 This top quality, heat-resistant, silicone strainer is the newest, most practical way to get your food strained thoroughly, while avoiding transferring the food out of the pot. The Snap'n Strain is flexible enough to fit onto nearly all pots, pans and bowls. It snaps on neatly with two clips. The clips' strong grip will keep it safely attached while in use and can be left attached to the pot while cooking. Once snapped, the pot can be tilted over a sink or bowl and the Snap'n Strain will do its magic. The liquids will be poured out while the food remains in the pot even with heavier foods like potatoes. The Snap'n Strain is super compact for storing. ORIGINAL MANUFACTURERS - Do not fall for the inferior design and quality of the imitations, Only the seller Home N' Goods carry the original Snap n' Strain designed and manufactured by Kitchen Gizmo. SAFE AND DURABLE- Completely BPA Free, Dishwasher safe and FDA approved. Made from top-quality silicone only the original Snap'n StrainTM will have the durability to last for many years. Will withstand straining of heavier foods like potatoes. PEACE OF MIND - With our 1 year warranty. As long as they were purchased new on Amazon, we will replace it free of charge. Warranty only valid for defects in materials or craftsmanship, any damages caused by misuse will void the warranty. If you have any questions about this product by Kitchen Gizmo, contact us by completing and submitting the form below. If you are looking for a specif part number, please include it with your message.